To follow up with earlier rumors we’re happy to report that the Zune HD 64GB is now a reality. Microsoft just announced the Zune HD 64GB for $349.99, available April 12, just outside of the event horizon that is the iPad ship date. This new device will run the 4.5 firmware. In addition to introducing the new 64GB capacity, we are also reducing the prices of the 16GB and 32GB devices. Starting today, new price lists are being distributed bringing the estimated retail price (ERP) for the Zune 16GB device to $199.99 and the Zune HD 32GB device to $269.99. 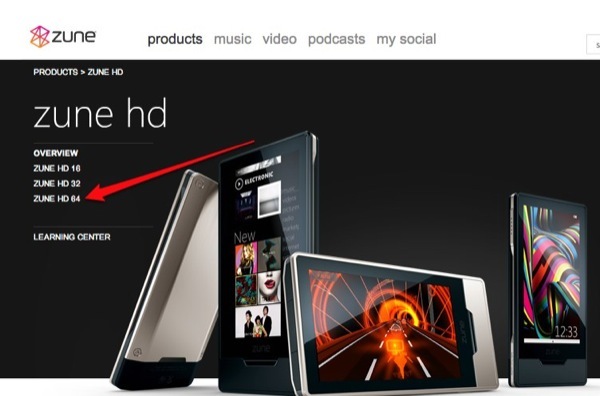 With its OLED multi-touch screen, built-in HD radio, HD video out capabilities and Internet browser, Zune HD is a full-function media player which has received accolades from press and consumers. We’ve also announced details of an upcoming firmware update which will add even more features to the device, such as Smart DJ auto-playlists capability directly on the Zune HD, ability to browse, stream and acquire music from Zune Marketplace on your TV (while the device is connected to a TV set through the A/V dock) and expanded codec support allowing users to play more video formats natively from the device.